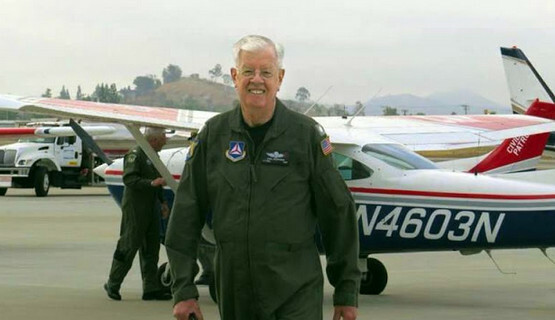 On April 6th, 2018 Civil Air Patrol’s Pacific Region Vice Commander Carl Morrison (75) died when he crashed N9133Z his private 1990 Mooney M20J, near Petaluma, California. At about 1700:30 the pilot received his IFR clearance from Petaluma Municipal Airport (O69) to Fallbrook Community Airpark (L18), Fallbrook, California. with a void time of 1710. A pilot rated witness familiar with operations at O69 was on the deck of the airport office monitoring common traffic advisory frequency when he heard the accident pilot radio “Petaluma ground, Mooney taxi to Runway 29” he then observed the airplane taxi to runway 11.
elevation of about 307 ft mean sea level, on a heading of about 200°. was displaced from the fuselage and came to rest on the right side and forward of the fuselage. continuity could not be verified on-scene due to impact damage and postcrash fire. Be the first to comment on "Pacific Region Vice Commander Dies in Crash of Personal Aircraft"